It seems more than likely that, before he leaves office, President Obama will break Woodrow Wilson's record for commutations of sentence. It is, however, more than a little amazing (if not highly informative) to compare the use of federal executive clemency in the two administrations. 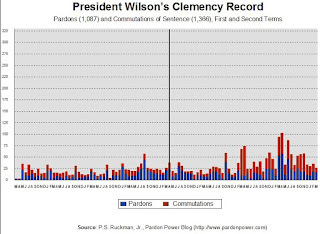 By the time he left the White House, Wilson had granted 1,087 presidential pardons (as well as 226 respites and 148 remissions). Obama, however, has granted a mere 70 pardons, the lowest number granted by any president serving at least one full term since John Adams. 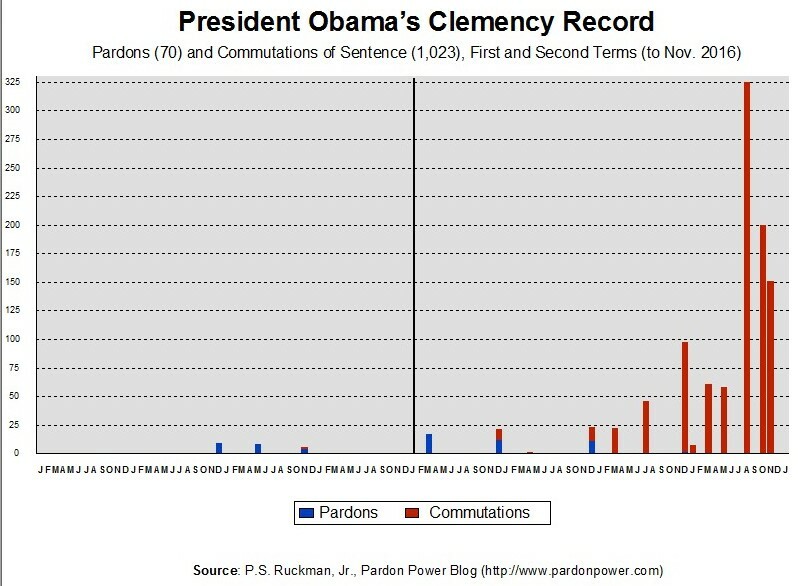 It doesn't seem likely that Obama will pass out 1,000 plus pardons between now and the end of the term. But there appears to be little concern about it on any front. So, it is what it is. Consequently, clemency, for Obama, has meant - for the most part - commutations of sentence, almost exclusively for those convicted of drug offenses. And these grants have - for the most part - been granted late in his second term. 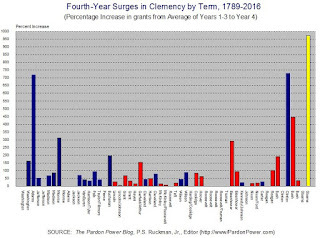 Indeed, the Obama administration already features the largest 4th-year clemency surge of any administration in history. 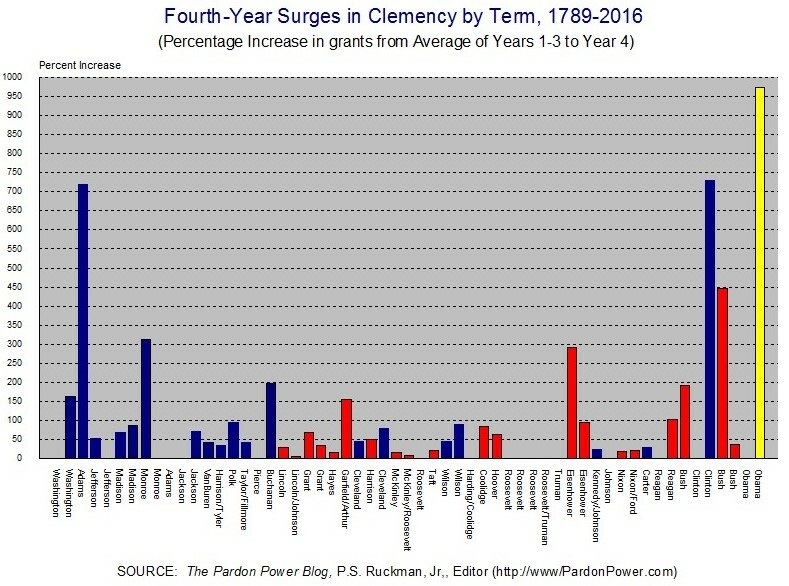 Notice, the Wilson administration (above) features no dramatic 4th-year clemency surge. 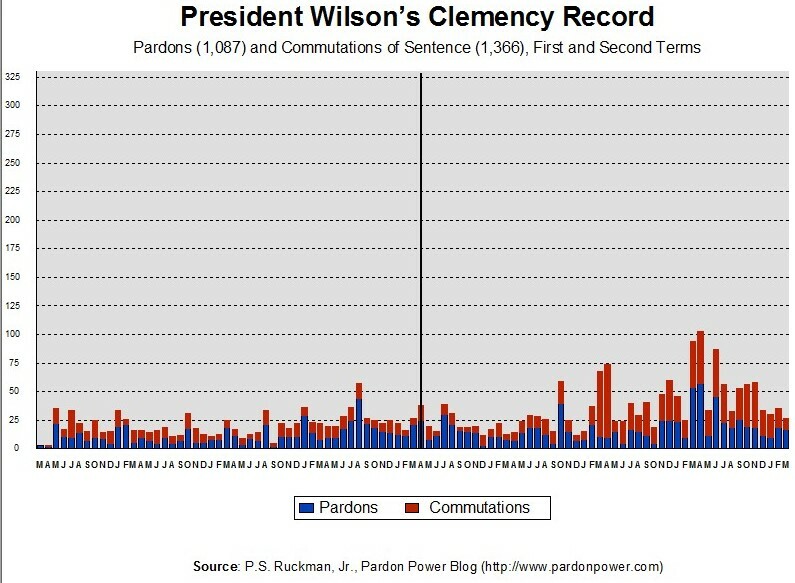 Yet Wilson holds the record for commutations of sentence (1,366) and he granted a thousand more pardons than Obama. How did that happen? It's simple. Like most presidents before him - and like most presidents throughout American history - Wilson granted pardons and/or commutations of sentence every month of his term. Clemency was not a last-minute stunt, afterthought, or mere adornment for Thanksgiving and Christmas. It was a regular, deliberative feature of separation of powers and checks and balances. Everything one needs to know about the need for clemency reform can be seen in these two charts. The federal prison population has boomed since Wilson's day. The Obama administration has been receiving record numbers of clemency applications, for years. On top of that, thousands remain in prison who were sentenced under drug laws which have been undone. The merciless neglect of the current clemency system needs to tanked. The process needs to be removed from career prosecutors in the DOJ who are unable / unwilling to process clemency applications in a timely fashion, with an eye toward mercy. The broken system has famously lacked transparency (since 1932) and, today, it even exempts itself FOIA law. It is time to create a permanent clemency board / commission (a device often used in the states) in the Executive Office of the President of the United States. It is time for mercy to emerge once again as a regular feature of criminal justice. It's not just about numbers. It is about balance, fairness. It is about rehabilitation and restoration. It's about presidents using a power that was given to them ... to use ... not to abuse, or neglect. President Obama and his NO Pardon policy?? Looks like he is 100% on board with drug dealers and commutations but when it comes to pardons for qualified Americans.....not so much. - It doesn't seem likely that Obama will pass out 1,000 plus pardons between now and the end of the term. But there appears to be little concern about it on any front. So, it is what it is. (post on pardon power). Spot on!